There are low hills to the north of the Fakenham road, and I had often wondered what it would be like to explore them. In Norfolk, you never need to get far away from a busy road to immerse yourself in lattices of narrow lanes, and moreover these hills appeared well wooded. On a map, there wasn't much out there. Tiny villages, but famous names for church explorers: Salle, and Cawston, and Booton. The summer before last I had begun to explore them. I was dying to go back. Some of the villages barely exist. One of the churches I'd already been to was Little Witchingham. 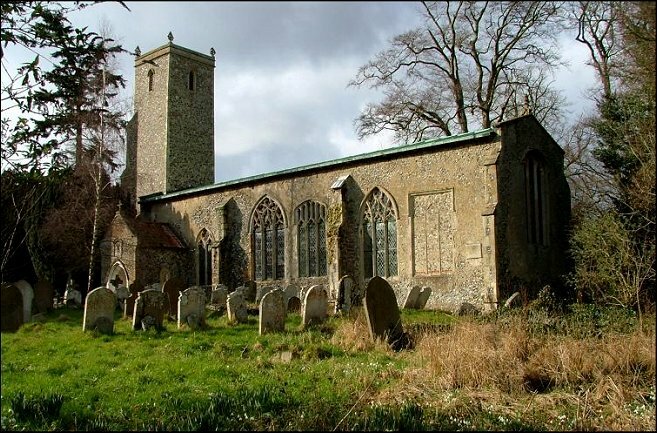 The tiny church there, just to the north of Alderford, is one of Norfolk's best kept secrets. In the heat of that June, the narrow lanes overshadowed by hedges still overgrown with late Spring fecundity, it was like being in a lost land. Coming back in winter, the trees were bare. And yet there was still something secretive, something elusive about these places on the way to nowhere in particular, a rambling landscape hazed by copses and punctuated by church towers. Alderford is also tiny. It has always been tiny. In the 1851 census, when the population of rural Norfolk was at its peak, there were barely sixty people living here. Today, there are perhaps half that. And yet, St John the Baptist survives as a working church, thanks to the sensible grouping of parishes together under one Benefice. St John the Baptist is in the friendly, welcoming Wensum group, and this is much to its fortune. 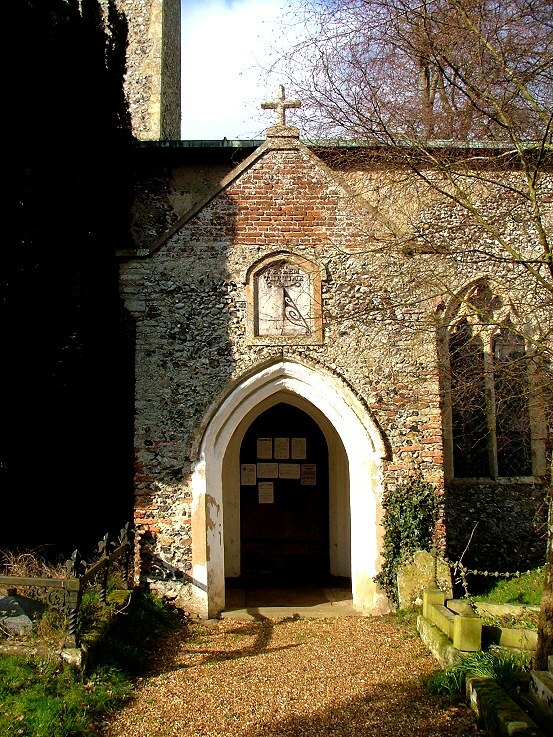 It is also an open church in summer, accessible with a nearby key in winter, and thus preserves a sense of continuity in the heart of its parish that locked churches lose. 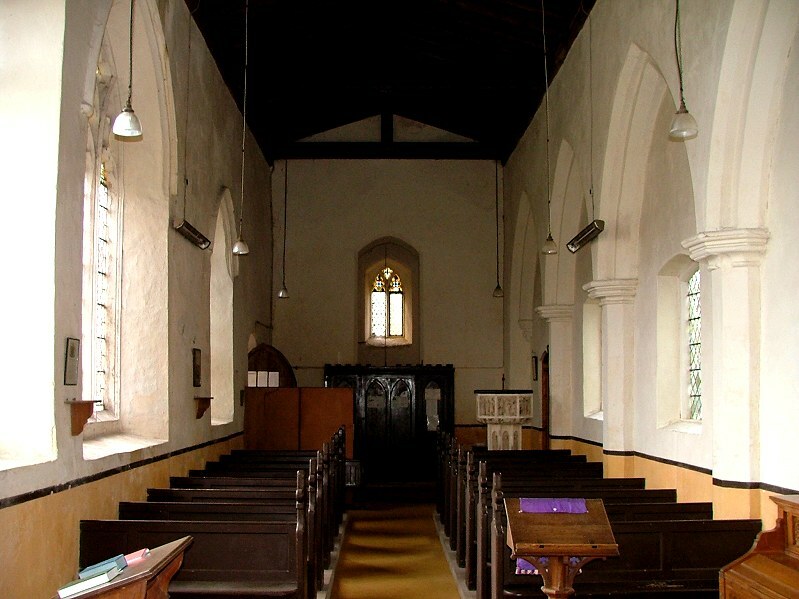 It is a narrow church, in a narrow hamlet. But even on this cold February day there was something lovely about it, and as I approached the sun came out for the first time that day, a day that had started in a blizzard. The tower is slender, perhaps too austere to be beautiful. Probably 14th century in origin, it is now heavily buttressed, and the top is rather curious, with 'Gothick' pinnacles, probably evidence of late 18th or early 19th century work. The church seems to have been given a bit of a makeover at this time, the pretty porch still with its wooden sundial reading Redeem the Time. As I say, this is a narrow church; but it was once wider. 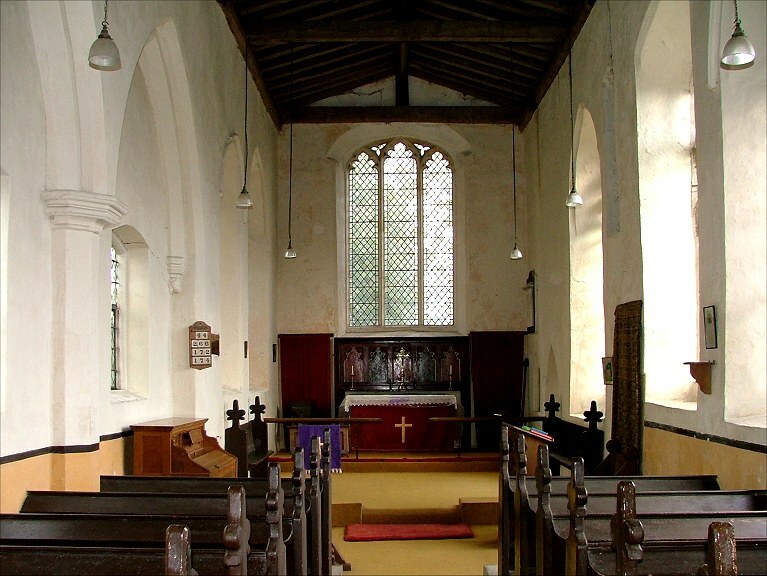 The north wall has the remains of an arcade set into it, and so there was once a north aisle. All other trace of this has gone, but it explains the setting of St John the Baptist's most famous feature, because as you go in you are confronted with one of England's 40-odd Seven Sacrament fonts. 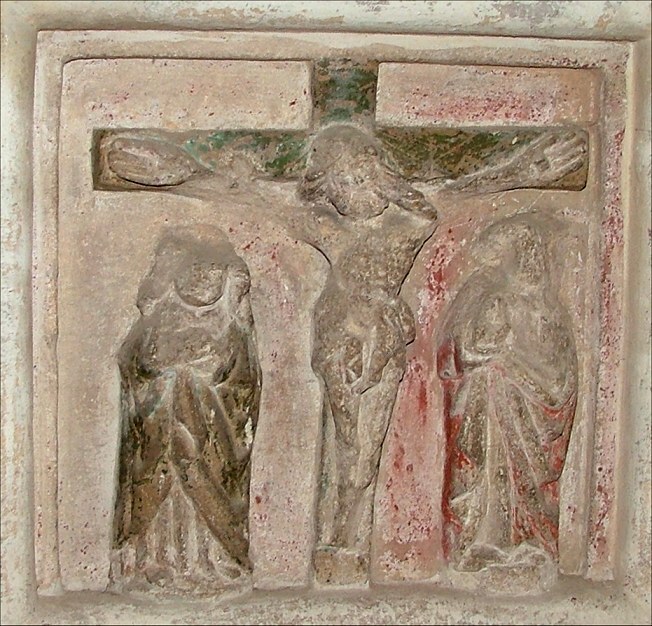 It is a good one, with lots of original colour - not as artistically dramatic as its near neighbour, the font at Great Witchingham, but homely, with rustic character. 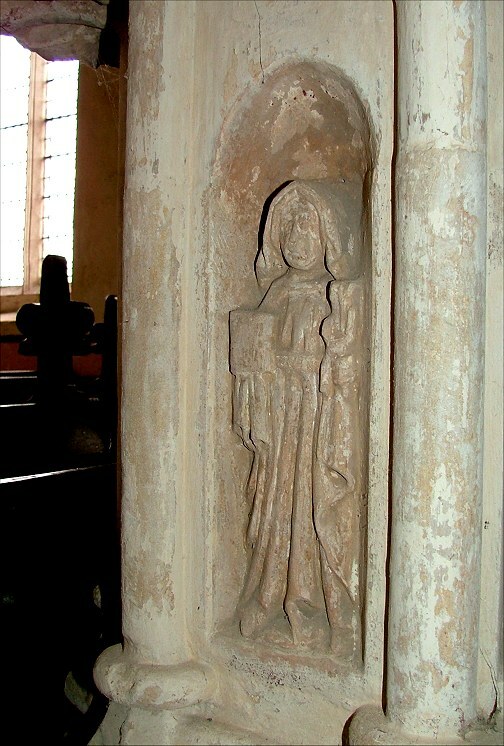 The curiosity of it is that, in this narrow setting, it is placed dramatically at the top of two high pedestals, with its northern face barely 30cm from the north wall. And yet, it appears to be in its original setting. The steps are older than the font itself. Clearly, when the church was wider, it would have appeared centrally placed. But the piece of wall against which it stands was part of the arcade, and so it has always been this close to the wall. This is interesting, because we know that, before the late Middle Ages, many fonts were placed against walls or against the pillars of arcades. 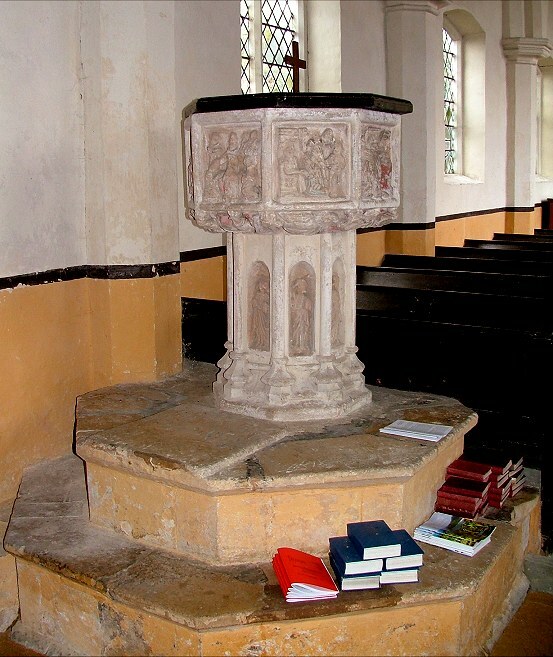 This font is quite late - a bequest in the 1520s seems to point to its installation, and it must therefore have replaced an earlier font on the same double pedestal. What was the earlier font like? There's no way of telling, but seven sacrament fonts were part of a wider late-Medieval project to reinforce Catholic orthodoxy in the face of local abuses and superstitions. 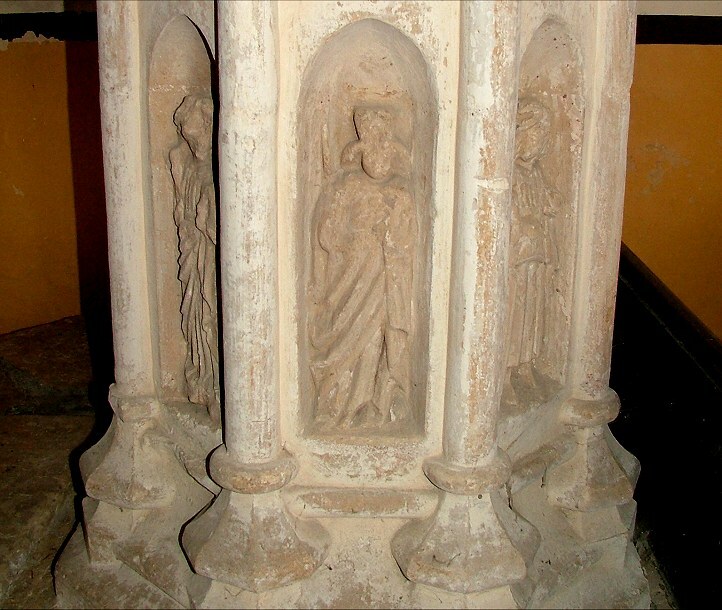 Many Norman fonts feature pagan imagery, and some of them - I think particularly of the fonts at Burnham Deepdale and Castle Rising - have a side which is clear of detail, showing that this was the side against the wall. Some of these fonts survive, but the vast majority must have been replaced in the late 14th, 15th and early 16th centuries. There are only seven Catholic sacraments, and late medieval fonts have eight sides, and so why was the panel on the north side here not left blank? 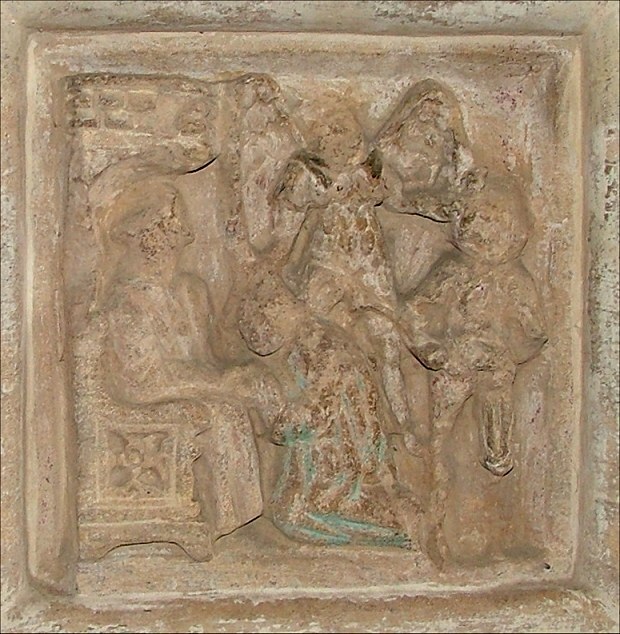 Simply, I think this is evidence that Seven Sacrament fonts were bought 'off the shelf' from stonemasons, and were not carved in situ or necessarily tailored to suit the setting. The Alderford churchwardens bought their font and did the best with it that they could. 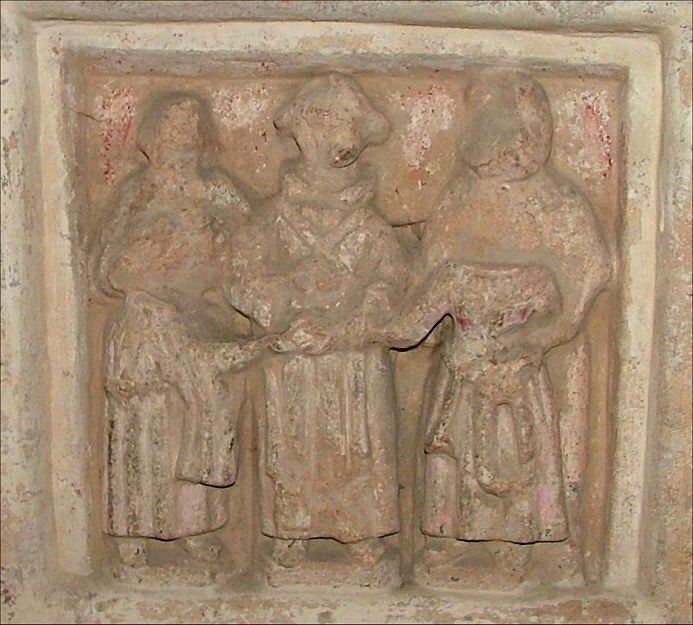 The Alderford font has low reliefs, and is not particularly badly vandalised; ordinarily at the Reformation, faces were chopped off before the font was plastered over, and that seems to have been done in a perfunctory way here. The angels below the bowl are particularly rich, in a cornucopia of detail. 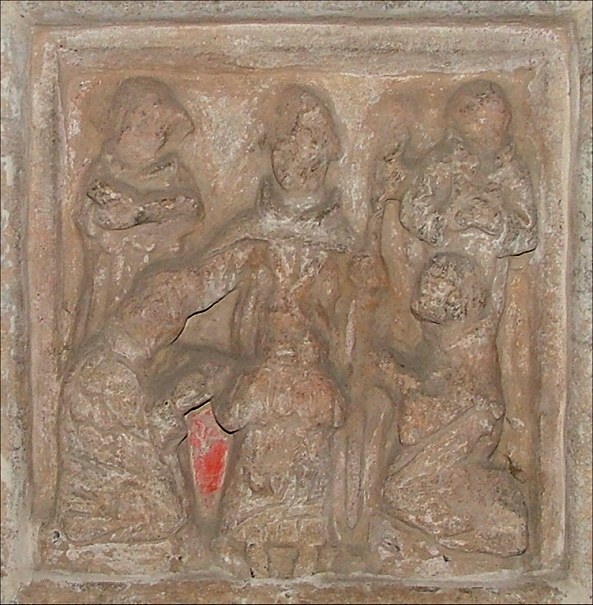 Twenty years later, this would become the full flowering of the English Renaissance on the Seven Sacrament font at Walsoken; but then the Reformation snuffed that Renaissance out, at least as far as churches are concerned. 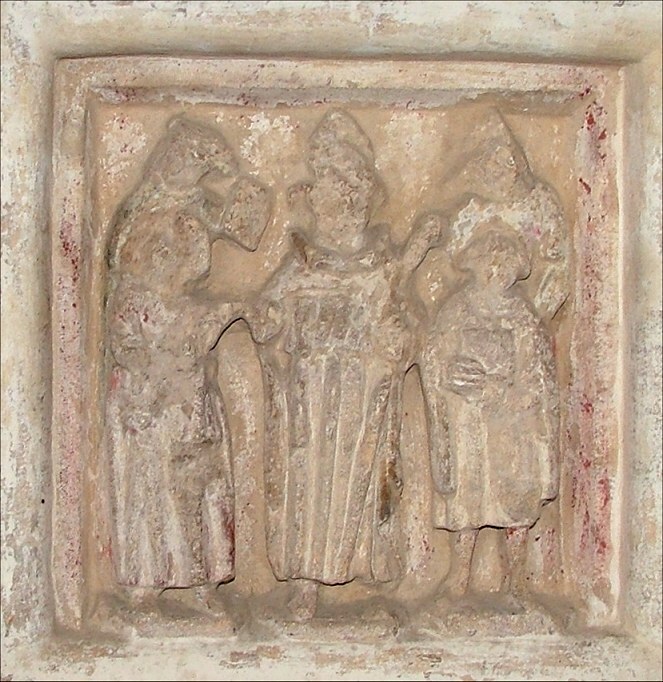 Anti-clockwise from the east, the panels here are Baptism, the Priest holding the baby and flanked by two acolytes, one holding a taper and the other a chrism chest with the holy oils, the parents standing in front; Crucifixion (NE), the odd-panel-out, but here perhaps the best panel, almost unvandalised, and John and Mary at the foot of the cross retaining colour in the drapery of their clothes; Last Rites (N), an unusually successful rendition of the dying man's bed, which always gave medieval masons problems, and the acolyte holding the chrism chest is here too; Matrimony (NW), the Priest, flanked by two acolytes, wrapping his stole around the hands of the happy couple, who have interestingly been completely effaced from the shoulders up; Ordination (W), the Bishop ordaining three Deacons, which is unusual; Confession (SW), another excellent panel, the Priest seated in a canopied chair, and angel protecting the confessee while a devil slinks away; Mass (S), the celebrant with his back to the viewer, the acolyte on one side holding a taper while the other rings a bell which swings wildly; and Confirmation (SE), less crowded than is usual in Norfolk, with just two candidates and those ubiquitous acolytes flanking the Priest behind. Images of all of these are below; hover to read captions and click on them to see them enlarged. I have corrected the perspective of the image of Last Rites to show it as if the arcade was not there. 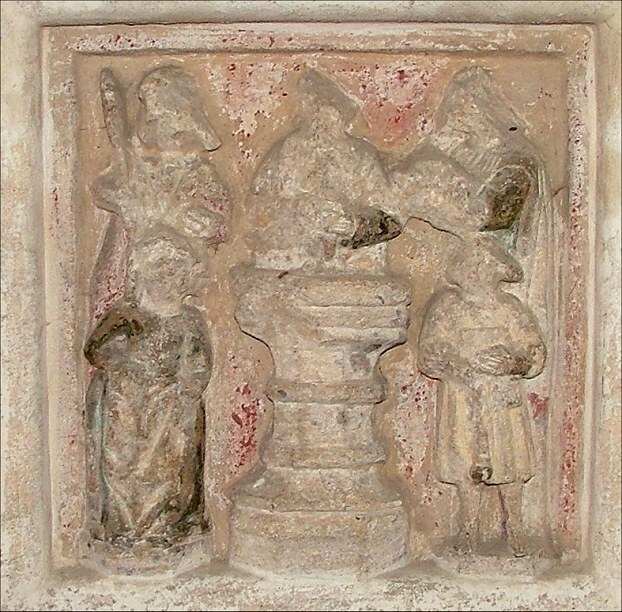 The shaft of the font has little niches with Saints in, again in good condition and battered more by the hands of time than of iconoclasm. 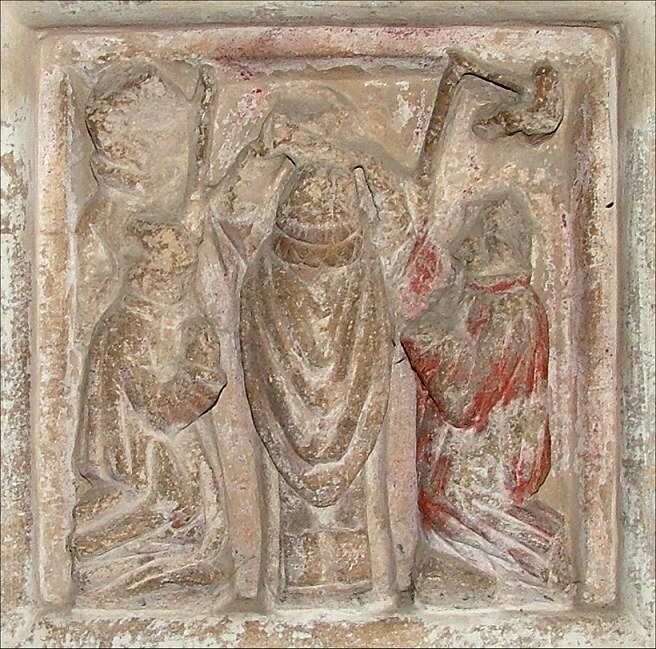 They appear to be eight Apostles; St Andrew is clearly identifiable, for example. 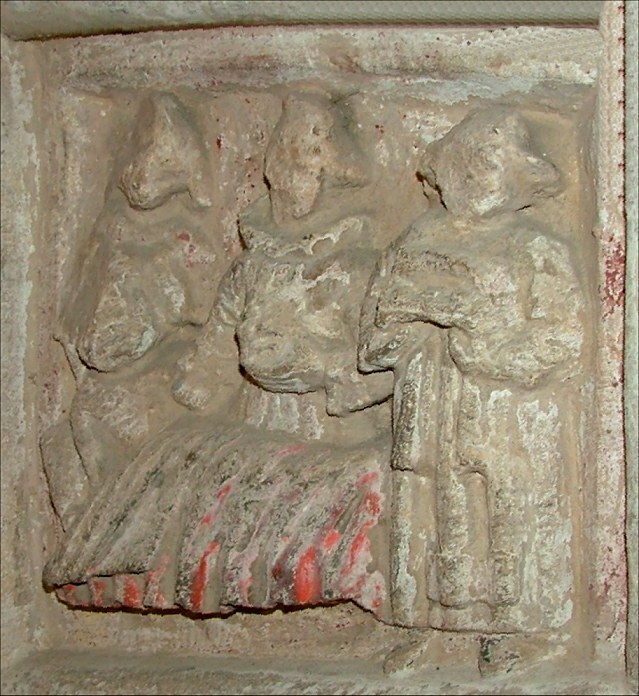 However, one appears to wear a crown, and may be intended as Henry VI, whose cult was reaching a peak at this time. Another, which has been identified as St James from the staff in his hand and the books, appears to wear a woman's head dress - could the staff be a crozier, making this St Etheldreda? The western side of the double pedestal is widened and raised slightly, to make a platform for the Priest. If you stand on it, you are raised quite dramatically above the benches to the east. Selwyn Tillett, the kind incumbent of this lovely group of parishes, tells me that baptising babies in this font would be a fairly hazardous operation if you didn't have a sense of balance and a firm pair of hands. The rest of the church is plain, simple, and pleasing. the rood loft stairway remains as a dramatic punctuation along the south wall. 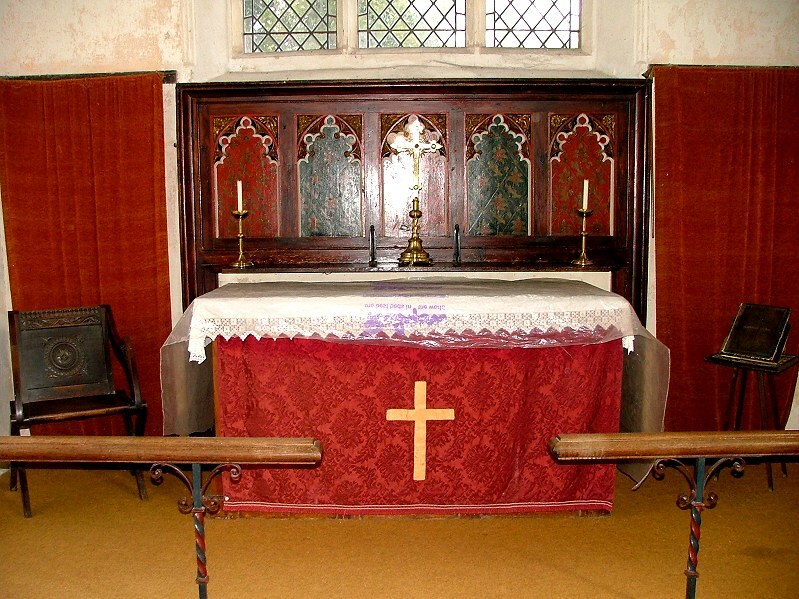 The altar is striking, and its reredos appears to contain some old woodwork, perhaps from a rood screen. Did it come from here originally? Something that certainly did can be seen as you leave. 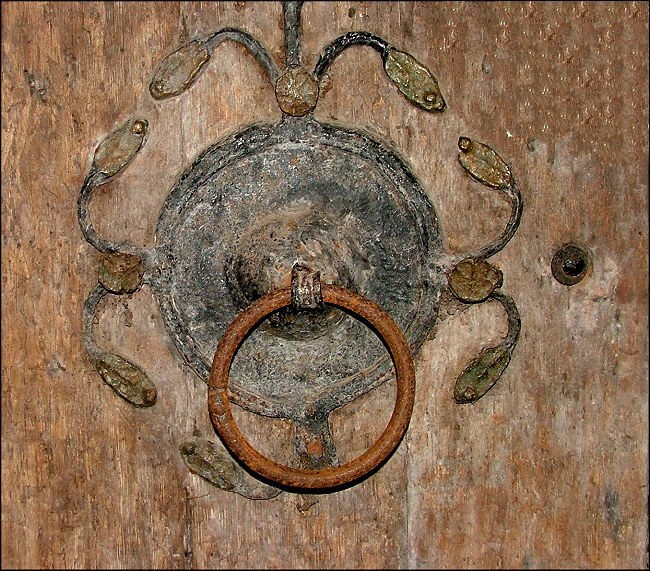 This is the door handle boss in the middle of the ancient door. Both of them have been here longer than the font, perhaps as long as the church itself. Now, there's continuity for you.